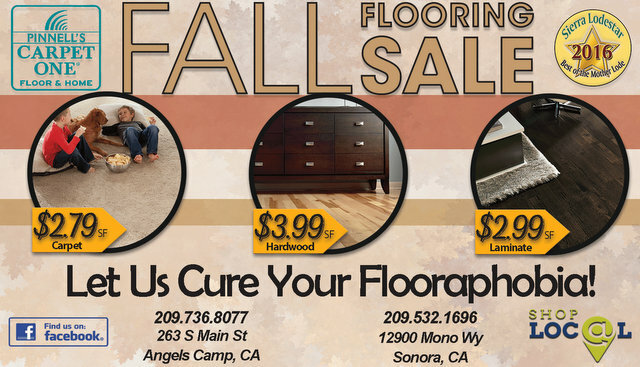 The Big Fall Flooring Sale At Pinnell's Carpet One! Let Us Cure Your Flooraphobia!! Dan is licensed in general construction, floor coverings, window coverings, and ceramic tile. Dan is the owner and operator of Pinnells Carpet One Floor & Home. He is a third generation flooring contractor, with flooring being both his father and his grandfather’s past livelihoods. Dan is licensed in general construction, floor coverings, window coverings, and ceramic tile. He opened his first store in Angels Camp in 1975 and his second Sonora store in 2006. Dan states his main goal has always been “to build and maintain a business with a reputation for honesty, dependability, quality craftsmanship and excellent customer service”. Dan feels he has achieved this goal and is proud of his company’s team. Everyone at Pinnell’s Carpet One truly value their client’s satisfaction and they will do whatever it takes to make them happy. Jeff is highly qualified to guide you from selection through installation and beyond. With over 3 decades of experience in the flooring industry, Jeff is highly qualified to guide you from selection through installation and beyond. In addition, Jeff is our go to guy for insurance claims! Drop by the showroom in Angels Camp or call for a home appointment. Joe can help you with all your flooring covering needs, whether it is carpet, wood, laminate, vinyl or ceramic tile. Joe has been at Pinnell’s Carpet One for eleven years. Joe earned his Associate of Arts degree in Business and moved to Calaveras County over twenty years ago with his wife, Colleen and their two sons. He loves anything outdoors and says he can’t imagine anywhere better than Calaveras County to “soak up the sun.” Joe can help you with all your flooring covering needs, whether it is carpet, wood, laminate, vinyl or ceramic tile. Joe says that at Pinnell’s Carpet One, he looks forward to each day, knowing that each day will bring a new client with a new challenge. His clients and their projects, no matter how big or small, are always equally important to him. Joe will always welcome your questions with the same enthusiasm, day after day. She specifically has many years of experience working with the Hunter Douglas window covering products. Sharon is a Design Consultant who has been with Pinnell’s Carpet One for six years. She has a Bachelors Degree in Fine Arts and began her career in the window covering field thirty years ago. She specifically has many years of experience working with the Hunter Douglas window covering products. Sharon says that “making people love and feel happy about where they live is what it is all about in this business” and that’s why she loves going to your homes and helping you see the difference that can be made with the right floor or window covering choices. Sharon also has an extensive knowledge of custom-made draperies that can help you complete your home as well. Let his expertise save you time and money! Jeff is one of our outstanding sales professionals in our Sonora store. He has 26 years of installation and sales experience that can take the hassle out of your next flooring project. Call for a free Estimate! With an intuitive sense of design, Shiree Hanson Segerstrom has the ability to translate her client's needs into comfortable, beautiful homes. A talent for blending and bending a variety of styles has lent Segerstrom a name with her list of well healed clients. The results are interiors that are fresh yet timeless, in sync with their inhabitants, architecture and location. Segerstrom's approach is simple: work closely with the client, develop a lasting rapport, and guide them patiently through the many decisions of designing a home. With more than eighteen years in the design industry, Segerstrom is at the top of her trade. Her favorite design projects are personal collaborations, blending the client's lifestyle, architectural style, and personal aesthetics with her own innate sense of design. Segerstrom has been featured in C Magazine, the San Francisco Chronicle, the Sacramento Bee, Bonham and Butterfield's Art and Antiques, the Wall Street Journal online and currently writes design related articles for examiner.com.